Humans have a deeply rooted need for stability, a sense of belonging, a home. “The soul is no traveller,” notes Ralph Waldo Emerson, “the wise man stays at home with the soul, and when his necessities, his duties, on any occasion call him from his house, or into foreign lands, he is at home still.” But by the turn of the twentieth century, man’s mobility went through significant changes, and with it grew a new spirit that brought challenges to that stability. This new spirit was in no doubt driven by the vast increase in one’s mobility due to advancements of machines, the new modes of transportation. Today’s postmodern era consists of internet super-highways, hotspots, Wi-Fi, social networking, email, chat, texting, cyber cafés, antennas of every nature, super-mega-everything, and a whole multitude of technologies that allow for even greater mobility, indeed a virtual mobility. But in spite of the new spirit of hyper-mobility, there still lies the search for stability. We find the restless soul searching for peaceful rest, for an anchor in the midst of a turbulent world defined by constant change. Even in the world of virtual mobility, with our smart phones and tablets, there is the prevalence of the question, ‘Where are you?’ by which many conversations begin. This demonstrates that one can virtually be anywhere, but at the same time humans have the deeply rooted need to know where they are in the world. Today, we are presented with a portrait of a radically mobile Jesus who is presented with the temptation of stability that is constricting and mission-defeating. “This is what I have come to do”. The gospel reminds us that the story of Jesus is always on the move and will not allow any of us hearers to remain who or where we are. Within a few short verses, the end of today's lesson will invite us to join this Jesus whose "preaching" and healing will take him "throughout the whole of Galilee" (Mark 1:29). Jesus by declining the offer of his disciples to remain in order to attend to the ever increasing needs of the growing crowds, is a critique of this skewed notion of stability, a stability that leads to missionary inertia. 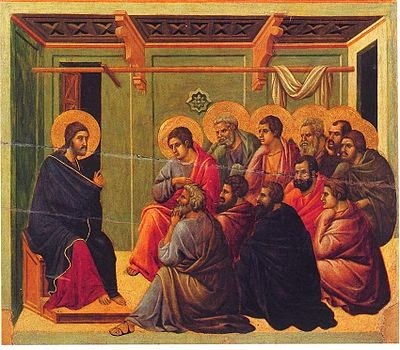 Jesus is reminding his disciples that the Church which he will found has to be outward looking in its approach, engaging the world, bringing it the good news, and not be caught up with internal politics and worldly concerns that makes her self-referential and irrelevant. The problem of being too self-enclosed and self-referential is that one quickly forgets that the Church exist as a sacrament of salvation for the world, that our purpose is to be missionary. But the actions of Jesus should not be interpreted as an endorsement for the rootlessness which defines modern culture. Jesus teaches us how to remain stable as well as mobile. Stability is to be found in rooting oneself in God and in Christ. The gospel records that after a busy day of ministry, Jesus finds his stable core in prayer. In the morning Jesus is up early and once again “in a lonely place,” away from the distracting crowds who constantly tempt him to be self-enclosed. In Christ, we come to understand how staying can be a new going. To maintain alive the awareness of the mission and not to close oneself up in the results already obtained, one must always be rooted in Christ. In him, we find the stability and certainty of God’s enduring presence. Similarly, in Him, we share the mission from the Father to “go forth”, which has to orientate every aspect of our lives as Christians. The reality of the Incarnation establishes a distinctly new world view – a “new” thing. “And the Word became flesh and made his dwelling among us” (Jn 1:14). The literal interpretation is “He pitched his tent among us.” Both stability and mobility is united in the very event of the Incarnation. Through the Incarnation, God the Omnipresent One, who cannot be confined by time and space, fixes Himself in place within humanity and manifested Himself in physical form and his presence continues in the Eucharist. In Christ, we find a bearing point from which the Christian can venture without fear of being lost or tossed by the waves of every changing idea or philosophy. For the Christian, there is a centre, a focal point, an anchor, an axis mundi, a point of connection between heaven and earth. Being rooted in Christ thus provides that unflinching stability to the Christian soul. Now, our entire world is ordered around this knowledge and our soul is no longer left to wander through the desert. As Christians travelling in the world of ever-increasing mobility, we remain at home. In Christ, we find both stability and mobility, permanence and change. In him, there is both the impetus to build and nurture stable communities and also the raison d’être to reach out to the fringes and margins to continue preaching his perennial gospel to the world hungering for the unflinching stability that only Christ can give.